Lombard is located approximately 24 miles west of the Chicago "Loop" in suburban Dupage county. Known as "the Lilac Village" Lombard is an established residential community, which traditionally served as a market center for surrounding rural areas. Settlers came when the railroad route westward from Chicago followed the St. Charles Road Trail. The population has more than quadrupled since 1960, as the village has shared in the economic growth that has come from an expanding Chicago metropolitan area. 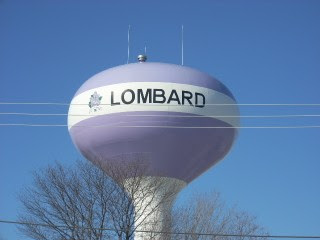 As of the 2000 census, Lombard had a total population of 42,322. A 2003 recount gave the village a population of 43,251. The total land area of Lombard is 9.9 square miles. The village's municipal neighbors include Addison to the north, Villa Park to the east , Downers Grove to the south, and Glen Ellyn to the west. Transportation links include U.S. Route's 64, 38 and 58. The I-88 East-West tollroad passes on the southern edge and the I-355 North-South tollroad is on the western border of the village. Commuter train service to Chicago is available in downtown Lombard. O'Hare International Airport is approximately 9 miles northeast. According to data from the Northern Illinois MLS there were 326 sales of single family homes in 2007, down from 403 in 2006. The average sales price was $305,129.00, this was a decrease from $325,982.00 in 2006. Marketing times were an average of 116 days on the market, up from the 2006 average of 89 days. As of February 17, 2008 there are 317 active listings of single family detached homes in the MLS. At the 2007 level of absorption this is 11.67 months of unsold available inventory. A 3-4 months supply of inventory is considered "in balance", this level is an oversupply. To recap 2007 for detached homes, sales volume was down -19.10%, average sales prices were down -6.39%, and the days on the market were up +30.33%. This market is oversupplied and the 317 active listings have already been on the market an average of 225 days. The condo/townhouse market had 238 sales, down from the 306 properties that sold in 2006. Sales prices saw a very slight decrease with the average 2007 sales price at $210,376.00, compared to $210,881.00 in 2006. Marketing times were an average of 94 days on the market, an increase from the 2006 average of 64 days. There are 226 active listings of attached homes in the MLS. Based on the 2007 level of absorption this is 11.39 months of unsold inventory. The condo/townhouse market is over supplied, sales volume was down -22.22%, average sales price decreased -0.23%,and can be considered stable, the days on the market increased +46.87%. The 226 active MLS listings have already been on the market an average of 186 days. Make sure that your listing is competitive, get a current appraisal. Complete appraisals of single family homes and condominiums start at $275.00. this is a small price to pay for knowledge that will help you position your house to sell in the current market.